Trials Rising is Ubisoft’s latest venture into the puzzle platformer genre and looks to innovate on the previous entries of the series in many different ways. I’ve always found the ‘Trials’ series to be great games that are easy to jump in and out of, but because of the similarities between levels I’ve never really continued past the initial excitement with them. Now ‘Trials Rising’ is out, I think that might be about to change. The main idea of the game is that you are a biker who will be competing in various tracks made by the developers to beat other players’ times and get gold medals (and eventually platinums when you unlock them), and when you get these medals you gain experience and unlock newer and more menacing tracks. The tracks start off fairly simple as you’d expect but get challenging fairly quickly and will really test the player. 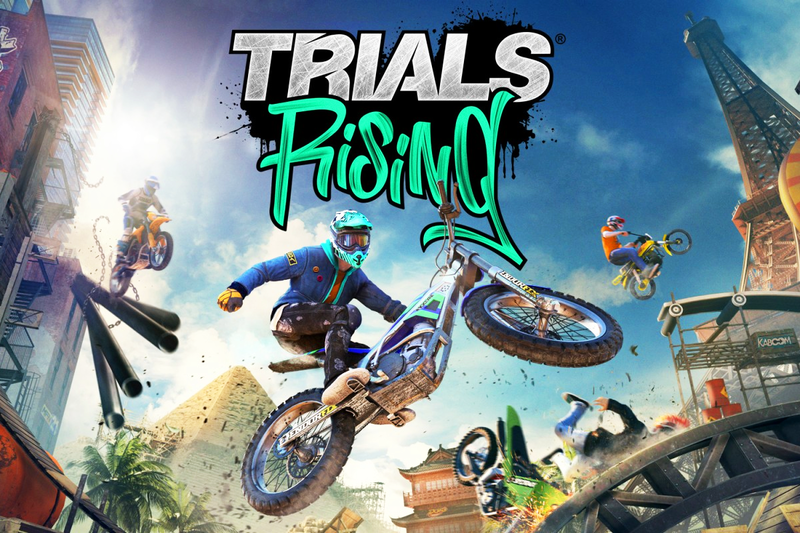 The game starts off with Trials University’, a series of tutorials and training levels that teach you all the skills that you need to surpass every obstacle that gets in your way. Some of these training levels are locked as you level up (generally more intense courses and techniques) so you are constantly learning throughout the game, rather than the standard “learn and do” model you often find in these sorts of games. It’s 2019, so of course one of the new features of the game is… loot boxes and micro-transactions! You’ll receive a loot box each time you level up which is filled with goodies to customise your character and bike with. I’m one of those people that gets quite obsessed with opening loot boxes (must be my inner gambler) but for me, these just didn’t do it – the variety isn’t great and most of the prizes are stickers for your equipment, which I’d say are the least exciting thing to receive. You can randomise your winnings using the paid for currency and also unlock certain emotes and other customisations, but of course actually paying real money to receive virtual leather jackets and face masks isn’t really what I want to be doing. You can earn this currency in-game as well, but the collectables to do so are very well-hidden so it would be nice if there were more options for earning them. Graphically the game is very similar to the previous entry in the series, ‘Trials: Fusion’, but there are improvements in the backgrounds and graphics that bring it to life more, and it’s certainly pleasing to look at. Performance-wise the game runs very well with hardly any frame rate drops – something you’d probably expect from a game like this. The only issue I’ve had with performance is the loading times which feel just that little bit too long, and sometimes the loading time and the time it takes to actually complete the track are just too close for my liking. The game offers a vast amount of content from different tracks, Trials University tutorials, and skill games, and as well as this you can also have a go at custom-made tracks added by the local community (a feature I absolutely loved in ‘Trials: Fusion’, though I never actually had a go at making my own). Within the main game you get to traverse the entire globe for your ‘Trials’ career, and I love how each track is so unique – there’s always something going on in the background (often producing effects for the track, such as bulldozers crashing into it), and the novelty danger endings for each race are also still present. There’s pretty much a limitless amount of content, with DLC already planned to come out within the coming months, and I could see myself losing potentially hundreds of hours to the game.